In efforts to develop a mutually beneficial partnership between Al Falah University and Dubai Media City, AFU’s Chancellor Dr. Noor Aldeen Atatreh and President, Prof. Abdelhafid Belarbi visited the office of H.E. Majed Al Suwaidi, the Managing Director of Dubai Media City, Dubai Studio City, and Dubai Production City. H.E Al Suwaidi welcomed the delegation and pointed out the need to develop cooperation with AFU to support the process of educational transformation in line with the rapid Media growth. Dr. Atatreh stated that Al Falah University aims to create a strong complementarity partnership with the DMC, considering its important role in the new media industry in the region. AFU’s partnership with AFU will have a beneficial impact on the students, as it can provide training opportunities. 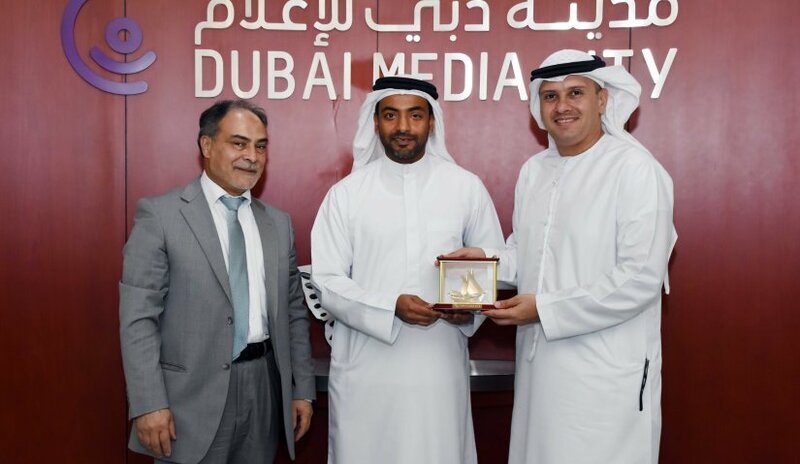 Towards the end of the meeting, Dr. Atatreh presented a plaque with AFU logo to H.E Al Suwaidi to acknowledge the council’s hard work in the service of the Emirate of Dubai and its Media Sector.